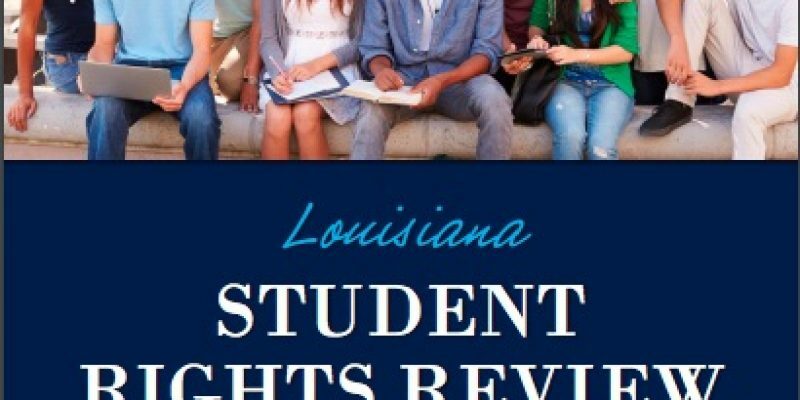 On January 2, 2018, Louisiana Attorney General Jeff Landry and U.S. Rep. Mike Johnson released guidelines about religion in public schools, called the Louisiana Student Rights Review, which includes answers to 26 “frequently asked questions” about religious freedom and public school education. The right to religious expression, in particular, has been increasingly challenged and misunderstood in recent years, and many people have been led to believe our elementary and secondary schools must be “religion-free” zones. To the contrary, both federal and state laws specifically protect religious freedom rights in public schools. Thankfully, Congress and our state legislature still recognize the fundamental importance of religious liberty—the first freedom listed in the Constitution’s Bill of Rights. The document is published and copyrighted by the Louisiana Department of Justice, and is divided into three section using a question-and-answer format. These sections address a student’s right to express religious beliefs, a student group’s right to express religious beliefs, and the rights of school employees to express their religious beliefs. The 15-page publication was mailed to all school superintendents in Louisiana and is available for free online. It has received both criticism and acclaim. Mixed reviews came from representatives of the ACLU of Louisiana and the Freedom From Religion Foundation (FFRF) who told the Shreveport Times that most of the law cited in the document is accurate– however, they have filed complaints or lawsuits in parishes specifically about religious expression in public schools. The ACLU also posted online its joint statement on religion in public schools. Representatives from the ACLU of Louisiana and FFRF and Devlin identified problems with it, arguing that it focuses too much on Christianity and in some ways could even be construed as promoting it. This, along with other efforts in 2011, followed the 1982 “balanced treatment” law, which required schools to teach both “creation science” and evolution but was struck down by the Supreme Court in 1987. And last spring, the University of Louisiana at Lafayette clarified legal questions related to prayer in public school at its annual legal conference. The Attorney General’s report is the most recent guideline in a history of the state’s efforts to ensure the limits of constitutionally-protected freedoms are made clear. Previous Article RESCHEDULED: The Hayride’s 2018 Truth And Consequences Tour Opens In Shreveport Feb. 22.